Verizon iPhone to be announced on January 11? More Verizon iPhone rumors… earlier today there was a report that the Verizon iPhone was going to be launched on February 3rd, but that may be wrong (or maybe it’s the availability date)… now press invites are being sent out to a Verizon event on Tuesday (Apple’s favorite day), January 11. Well, for one thing, I don’t typically get invites directly from Verizon to anything. At least not that I can recall. They usually send those directly to the MobileCrunch and CrunchGear guys. But this invite appears to very specifically be for me — it’s non-transferable. 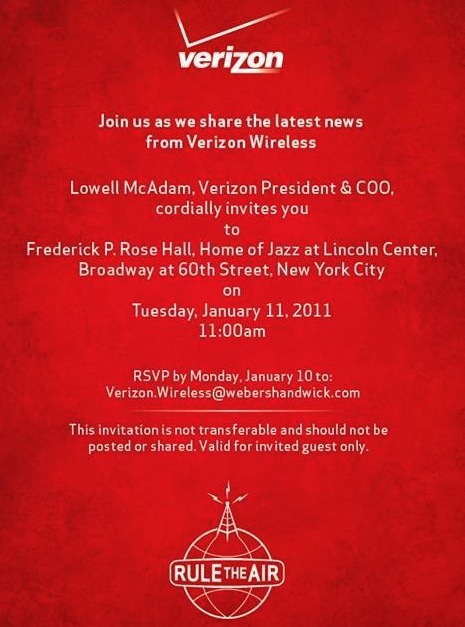 Would Verizon send me such an invite unless it was specially about Apple? In case you didn’t know, MG Siegler is TechCrunch’s resident Apple fan, so it would be a fitting selection for Verizon to choose. While there’s no specific mention of Apple on the invite, the only thing expected to come out of Verizon that wasn’t already announced at the CES Expo is the Verizon iPhone. Is anyone else sick of the Verizon iPhone rumors? Just release it already. Man I know this is a “big deal” but I just don’t care at all. Maybe because I’m locked into AT&T for another year, maybe because I used to have Verizon and didn’t find them to be much different from ATT. The real question is are they going to buy out my contract if I switch? Are the plans going to be cheaper? Is the phone going to be better? This will be big, definitely the iPhone. I will most definately be getting this. I’ve been crazy for one of things; I might cry if I get one. « Verizon iPhone Launch Date: February 3rd?